your book a natural for a book club selection? 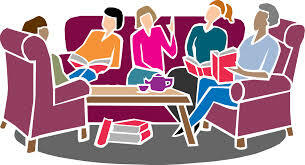 Although we think of book club selections as literary novels, there are book clubs that focus on every type of book from mysteries to history to poetry to memoirs. So how do you wrap your book up in a big red bow that says "Book Club"? If you missed the chance to add a book club page to the end of your book (and even if you did add one) it's time to add a Book Club page to your book's website. So what should a Book Club page include? Discussion Questions -- The trick to book club discussion questions is to find the middle ground between yes/no or one correct answer questions and questions that will start battles to the death between members. Other book's questions can often give you a jump start or you can check out the generic questions compiled by the American Library Association. Recipes -- Yes, book clubs gather to discuss books. But they also like to party -- and what better way to party than with some book related food. If your book includes some special meals, visits to places known for unique foods or you can just have some fun with book pun recipes, go for it. An appetizer, a dessert and a beverage are a good way to start. Add to your book club cookbook depending on how comfortable you are in the kitchen. Field Trips -- This can be an actual field trip, such as visiting a spot the book's characters visited or taking a hike after reading Cheryl Strayed's Wild. Then there are virtual field trips such as a website about West Point for a group reading Susan G. Weidener's A Portrait of Love and Honor or a DVD of a Nob theatre performance for those reading Nina Schuyler's The Translator. Special Activities -- For young readers, arts and crafts are the perfect way to connect to a book. Tom Angleberger's made his Origami Yoda series memorable by including directions to make origami Star Wars characters which my son and nephew happily folded. For adults, activities can run a wide gamut. Plant some flower seeds for Jeanne Ray's novel about florists Julie and Romeo or try painting after reading Imogen Robertson's The Paris Winter. Or how about a natural for book lovers, a bookmark made reflecting the book's theme or title -- a bookmark decorated with a bird stamp for Donna Tartt's The Goldfinch. Meet the Author -- Include an author interview sharing the inside story about the book: where the idea came from, some things that got cut, hidden significance behind characters' names, hobbies or quirks, difficulties during the writing and publishing process. If you're willing, you can also offer to attend book club meetings with the help of Skype or using speakerphone. Lists -- Everyone loves lists. Lists of books that influenced your book, lists of books with more information on topics covered in your book,"If you liked my book, you'll also like these books" lists, twenty things about the author lists. Just have some fun while giving the readers some bonus information. I'll be back late this month with some ideas about how to get your fabulous new Book Club Kit into the hands of people who decide what book clubs will be reading next. Sorry, I can't give you Oprah's contact info but I'll do my best! I love your suggestions. They're clever, and would help make any book club meeting a fun event. Thanks.